A simple yet elegant option for your Thanksgiving side dish. 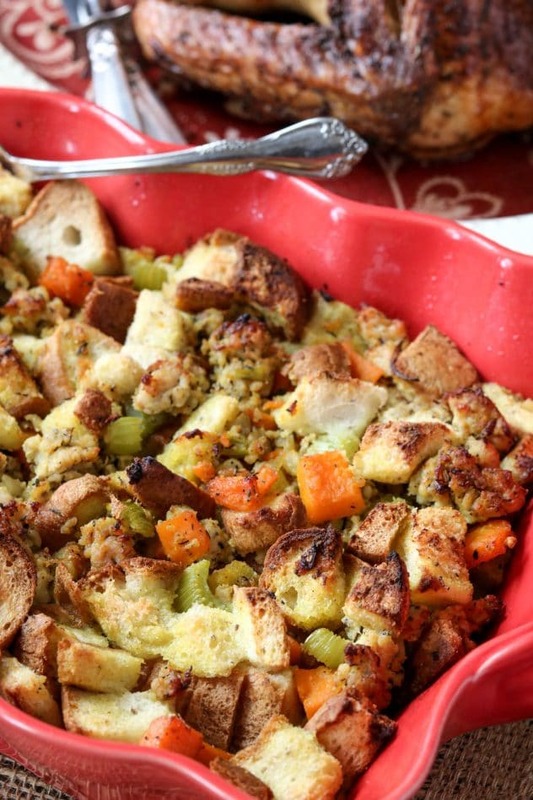 Stuffing, oh, stuffing, another one of my favorite Thanksgiving side dishes! This butternut sausage stuffing is savory and full of flavor. You can also use any of your favorite gluten-free breads with this recipe if preferred. The sweet Italian chicken sausage brings out the additional flavor, along with the chicken broth, butternut squash, celery, onions, and seasonings. I promise you that removing gluten products from your diet does not mean you have to compromise on flavor. 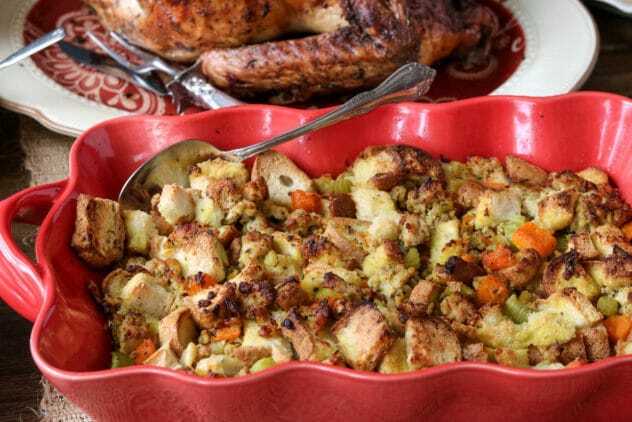 You can also make the majority of this stuffing ahead of time, like the night before, to cut back on preparation time come Thanksgiving day. As I mentioned before, I’m going to include a preparation and cooking timeline with the meal plan to help you plan our your cooking schedule. I never knew cooking a large meal like this was such a jigsaw puzzle. Having to get everything cooked, but not at the same time, but keep it all warm, it’s definitely a challenge! But YOU can do it! In a large skillet, melt the butter over medium heat. Add in chopped onion, celery, and squash. Sauté until the vegetables begin to soften. Add in spices and stir well. Add in chicken sausage and continue to cook until sausage is cooked through. While the vegetable and sausage mixture is cooking, cut the loaf of french bread into cubes and add to a large mixing bowl. Once sausage mixture is done cooking, add to bowl with bread cubes and toss together. 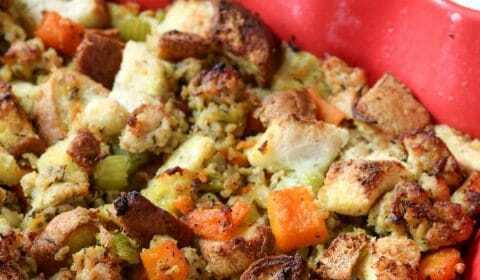 Grease a 9×13 baking pan and add stuffing to pan. Pour chicken broth evenly over the stuffing mixture and toss. Bake for 45-55 minutes or until golden brown on top.